The ASA platform has fantastic built-in packet capture capabilities which can come in very handy for troubleshooting issues. I will be demonstrating some of the capabilities using an ASA 5505 running version 9.0(1). Performing a packet capture is done using the capture command from privileged exec mode. result in an excessive amount of non-displayed packets due to performance limitations. A common scenario is to determine if you are seeing bidirectional traffic to a host on the internet. For this example, I'm going to validate that I am seeing IP traffic to 8.8.8.8, one of Google's public DNS servers. We can verify the config by running 'show capture'. Looking at the results, you should notice that it automatically added the type 'raw-data' and also lists the amount of captured data. The raw-data type will capture any IP traffic that is transmitted through the ASA. Now we can look at the captured data using 'show capture asa_cap'. Each captured packet shows a timestamp of the time the packet was received, the VLAN ID since this is a 5505, the source IP and port, the destination IP and port, the type of packet, and the packet size. For TCP traffic it will also list the TCP MSS size which can be extremely helpful for troubleshooting MTU issues. You can also examine a specific packet using the 'packet-number ' keyword and view some more packet details using the 'details' keyword. The details will include the TCP window size, TCP flags such as SYN and ACK, TTL, and if the DF bit is set. If I want to do a quick packet capture, I typically skip the access-list altogether. You can do it inline using a 5-tuple match. A 5-tuple match uses 5 values to match a packet for the capture. Those values are protocol, source IP address, source port, destination IP address, and destination port. I also use the real-time keyword so that it will buffer the captured packets as well as follow them on the screen. This time will capture packets to one of Google's web servers. Note that if you specify the capture traffic inline you do not need to specify the return traffic, it will match that automatically. 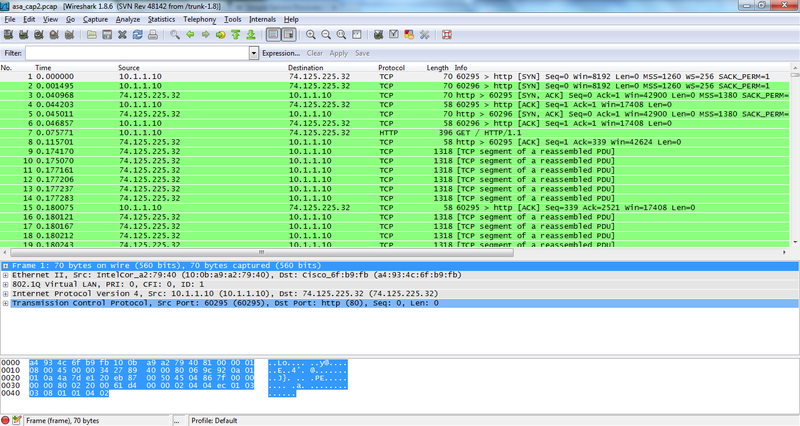 You can also use the packet capture functionality to see any packet drops on the firewall. This can be helpful if you are not seeing bidirectional traffic with a raw packet capture even though you are expecting it. This is done using the 'type asp-drop'. You can also specify they type of drop, such as acl_drop or no_route. For our purposes, we will capture all drop types. You can see that my workstation is sending out multicast discovery messages for UPnP and my the ASA does not forward multicast packets by default, so it drops them. At this point we have created a packet capture to capture raw packets matched by an access-list or inline. We have also captured dropped packets. But what if you want to examine the packet captures in even more details than what the ASA can provide? Thankfully the ASA has a way of downloading the pcap file. You can accomplish this through the copy command. If you exclude the /pcap flag, the capture will still be uploaded to your tftp server, but it will be uploaded in the same format in which it's displayed using the 'show capture ' command. You can see below it displays the capture in Wireshark the same as it would if you ran the packet capture locally on your PC. The packet capture is a powerful and useful tool that can be used to easily troubleshoot a lot of network and firewall issues. What I've demonstrated above is an overview of some of the capabilities. I urge you to explore deeper into this tool and discover everything else you can do. You can use it to capture different ethertype packets, encrypted and decrypted IPSec traffic if it is terminated at the ASA, webvpn traffic, and more. One of my favorite uses is to prove (or disprove) proper NAT configuration. This was especially helpful when I was learning the changes that were first introduced in the 8.3 firmware. I will create two captures. One will capture traffic on the inside interface (on ingress) to a particular destination and one will capture traffic on the outside interface (on egress). The outside capture should show the outside local IP address as the source (and destination for return traffic). You can compare the two captures using timestamps and TCP data, such as source port. This can be a quick way to validate that your NAT configuration is good, or show that it needs some more work. It's that time of year again. New Years traditionally is a time to reflect upon the year and make resolutions for the upcoming year. Like so many others, I have decided to make a blog post to document and motivate my goals for 2014. So here goes. 1. Attain a better work/life balance. As is the nature of networking and working for a VAR, I find myself working after hours quite frequently. This makes it challenging to keep a healthy lifestyle outside of the workplace. This is going to be a work in progress all year, but I hope to find a good balance. 2. Blog more. I have several ideas saved up for future blog posts that I would like to write. The ultimate goal is to make it easier for younger people to enter and succeed in the field. As a side effect, it will help me learn as I further my learning and will be a reference for me in the future. 3. Attain CCNP R&S certification. I have the CCNP switch exam out of the way. I am currently studying for the routing exam and I purchased a block of Cisco Learning Lab hours. I would like pass both routing and tshoot exams in 2014. 1. I would like to become more physically fit. I'm not really out of shape, but I don't work proactively to keep in shape. As I've discovered, the better I take care of myself the better I feel. I recently ordered a FitBit Force, which tracks fitness habits and sleep patterns. 2. Spend more time with family and friends. My family all lives close by, but I don't see them as often as I would like, maybe once or twice a month. My brother has three kids that I love to death and would love to see more often. 3. Vacation more often. This goes along with having a healthy work/life balance.I really should utilize all my given vacation time and use it to travel around the country and/or the world. I love travelling, but I'm often constrained by time and money, but short trips can be relatively inexpensive and are great at dealing with work stress. So those are my resolutions for the year. Feel free to offer suggestions or add your own goals in the comments. My previous blog post was about dual homing a Nortel switch or switch stack with a pair of Nexus 5k or 7k devices. This post will expand upon that configuration and connect our pair of Nexus switches with two stacks of Nortel 5020 switches running in an SMLT configuration. As you can see, we have two stacks of three Nortel switches used for aggregation and server access switches. This could alternatively be a pair of Passport 8600 switches. There are three interfaces configured as the inter-switch trunk (IST). The IST is similar to the vPC peer link. Each switch on the top stack is connected to Nexus01 and each switch on the bottom stack are connected to Nexus02. As you can see, we are using VLAN 1000 for the IST connection, disabling spanning-tree for the IST ports, creating MLT ID 1 and designating it as an IST. The IST VLAN is used for SMLT exchanges and keepalives. Since MLT/SMLT connections don't use any negoitiation mechanism to form the trunk, we need something that can detect a failure at layer 2 to layer 3. This is where VLACP comes in. VLACP is a Nortel proprietary protocol similar to LACP and used in conjunction with MLT and SMLT connections. Like LACP, if an interface fails to see hello packets from it's neighbor interface, it will bring that interface to a down state to prevent packet loss. At this point, our IST should be established between the two switches. We need to configure the uplinks to the Nexus switches and assign VLANs to the trunks. We will be utilizing LACP for this connection. As you can see, this configuration is similar to the LACP configuration from a single Nortel switch with one noticeable difference. By default, LACP creates a system id based on the built-in MAC address of a switch. Since we are connecting two switch stacks to the Nexus switches, we need to define a shared system id to use. As shown above, we start by associating the lacp key with an MLT and SMLT id. We then assign an SMLT system id. You can just use the built-in address from one of the switches. 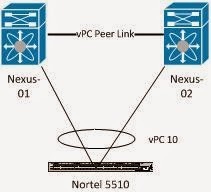 We already covered the configuration for the Nexus port-channels in the previous blog post. The configuration is identical except that we are bundling more interfaces. At this point, everything should be connected and working properly. You can verify the LACP system ID on the Nexus switches by issuing the "show lacp neighbors" command. You can also verify that the port channels are live and passed the vPC consistency check with a "show vpc". I have a customer that currently has a network with a pair of Nortel Passport 8000 switches as their core and a bunch of Nortel 5510 and 5520 access switches for server and workstation connectivity. This customer decided to purchase a pair of Nexus 5596T switches to replace the Nortel 8000 switches. In the existing environment, they are utilizing Nortel's split multi-link trunking (SMLT) for layer 2 resiliency and aggregation. I have been tasked with setup of the new Nexus switches and configuring a similar topology using Cisco vPC technology for layer 2 resiliency and aggregation. In this example, we are going to create vPC peer-link and a single LACP port channel to a Nortel 5510 switch. 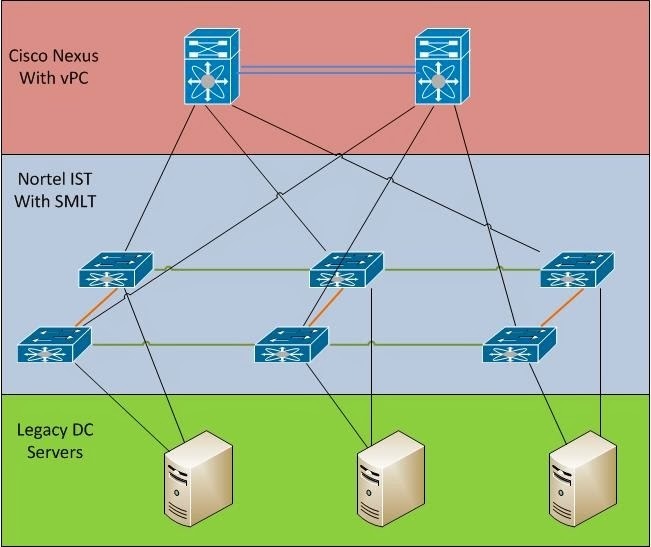 Let's start with the basic Nexus vPC configuration. I'm not going to spend a lot of time on it as it's been covered by many people. And now we confirm that the vPC peer-link is up and working properly. And now that the vPC connection is up between the switches, we can configure the port-channel for the Nortel switch. *Update: The configuration "no lacp graceful-convergence" was added to the port channel interfaces. LACP graceful convergence was introduced in version 5.1(3)N1(1) and is on by default. Cisco recommends disabling this feature on port channels connected to non NX-OS devices as it can cause the interfaces to inexplicibly enter a standby state. And now for the multi-link trunk (MLT) configuration on the Nortel switch. Note that I left the PVID untagged for the two uplink ports to ensure compatibility with the Nexus switches since Cisco uses the concept of native VLANs on trunk ports. For this example, we are keeping it simple and using VLAN 1 for the native VLAN. When you configure an LACP key on the Nortel switch, it assigns the unique LACP key to an MLT starting with the highest number MLT (32 in this case) and working backwards. 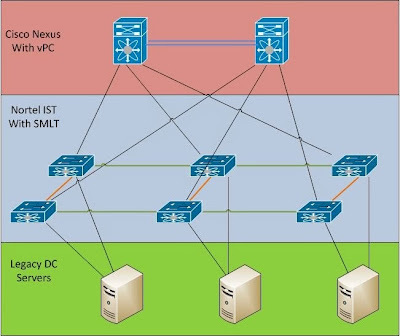 The LACP key is local to the switch or stack and is similar to the channel-group with the Nexus switches. The MLT ID is similar to the port-channel interface on the Nexus switches. At this point, the port-channel and MLT should be up on all the switches. Let's confirm. As you can see, LACP is up on all switches and vPC 10 is up on both Nexus switches. At this point we can confirm connectivity. As we can see, ping works from each of the Nexus switches and from the Nortel switch to each Nexus switch and the shared HSRP IP. The biggest caveat with this configuration is that you cannot change VLAN assignments on the trunk while LACP is active on the Nortel switch. If you change the allowed VLANs on either side of the trunk, it brings down the LACP neighborship until you disable and re-enable LACP on both uplinks. For this reason, I recommend you set the allowed VLANs on the port-channel on the Nexus switches to prevent the trunk from going down simply by creating a VLAN on the switch. I manage a good number of Cisco ASA 5505 firewalls. I am currently working on one for a remote employee for a company who's network I manage. The firewall, at the time, was running 9.1(1)4. I discovered an issue with that code where the VPN process will occasionally cause the firewall to crash and become unresponsive for about 10-15 minutes. In an effort to update this firewall, which happens to be in Pennsylvania (I'm in Iowa), I uploaded the new firewall and attempted to reload the device. I type reload, hit enter twice to confirm, and nothing happens! I tried it several times with different flags, including reload quick and reload noconfirm. Nothing worked! I got so desperate I even opened ASDM and attempted to reload there, thinking it might have different hooks into the underlying OS. That failed as well. Desperate to get this firewall rebooted to fix the VPN bug (and this newly discovered reload bug, likely caused by the VPN bug), I came across the crashinfo command. To preface this, if you aren't familiar with ASAs, if they crash they dump a bunch of information to a text file on the flash drive called crash.txt. It contains a bunch of debug information, including the current memory contents and the process(es) that crashed. The crashinfo command allows you to view or save the crash info and also allows you to simulate a crash, either by doing a test or a forced crash as you can see from the output below. and the firewall immediately rebooted and came up on the new firmware. I wouldn't recommend doing this unless you absolutely have to, but it did bail me out in this situation. My name is Mike. I am currently a technical consultant/network engineer for an MSP and Service Provider in Central Iowa. I have been working in this industry for about 3 years and I am currently the lead network engineer working primarily with Cisco routers, switches, and firewalls. Due to the nature of the business however, I do find myself working with a vast range of vendors, including HP, Juniper, Dell (formerly Force10 and PowerConnect), Fortinet, Foundry, Nortel, and so on. I also work quite a bit with storage and virtualization. The purpose of this blog is two-fold. The first is to keep a personal repository of different issues I have come upon and new technologies I learn and implement. The second purpose is the offer yet another location where fellow networkers coming up in the business can hopefully benefit from some of the topics I post about. I realize there are already more blogs than I can count, but I'm hoping to offer my own perspective and I will hopefully be beneficial to some people. If anyone has any questions about any blog posts or anything else, feel free to reach out to be at blog@networknerdmike.com or on Twitter @networknerdmike.